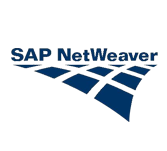 SAP NetWeaver is an open technology platform that offers a comprehensive set of technologies. These technologies are used for running mission-critical business applications and integrating people, processes, and information. The open standards are utilized to enable integration with information and applications from any source or technology. The basics of SAP NetWeaver are explained in this tutorial. The end of this tutorial will move you to a moderate level of expertise. This possess fair knowledge on how to use platform for your benefit. The course is designed for beginners with little or no SAP NetWeaver experience. The basic understanding of SAP basics most useful for this.